Scientists are blaming a slew of shark attacks last weekend on the annual bird migration, as sharks pursue their avian prey. So it’s a good time for all Daytona Beach swimmers to revisit the five biggest shark attack myths out there before entering the water in the days to come. One of the three surfers attacked on Sunday posted a photograph on social media showing bites on his hands, according to the Daytona Beach News-Journal. “Both of my hands were injured and I’ll need hand surgery in a couple hours,” said the caption on Facebook. Another victim was a teenage boy who suffered minor laceration to his inner thigh, but wasn’t transported to a hospital, the third a 43-year old man who was bit on the lower leg. If you’re worried about being bitten, below we bust five shark attack myths for all Daytona Beach swimmers. While media in the past have portrayed sharks as cold-blooded killers who come after people (think Jaws or The Shallows), this is simply not true and one of the biggest misconceptions people have of the large fish. Sharks are typically chasing their usual prey — in most cases fish. But because people are splashing around, the motions may confuse the shark and lead the animal to take an exploratory bite, says National Geographic. It is true that swimming, surfing, spearfishing, and diving, among other water activities, can put people in closer contact to sharks. But George Burgess, shark expert and curator at the Florida Museum of Natural History, told National Geographic that the few species of large sharks, such as a bull or tiger, that do hunt man-sized prey and not small fish, confuse humans for seals. While high-profile exploratory bites do occur, such as those during surfing competitions, studies show that in California, for example, a surfer has a 1 in 17 million chance of being bitten. The United States Lifesaving Association says that there is less than one in three million that a person will be bitten by a shark while swimming in Florida beaches. In most cases, surfers are typically further out from shore and spend a longer amount of time in the water compared to the average beachgoer. Experts argue that sharks can perceive this as a territorial issue while they’re hunting for prey and attack the human instead. Also, a majority of incidents are “provoked” attacks, in which case someone is bitten while spearfishing or attempting to catch and release it from a line or net, notes National Geographic. This is a common myth, perpetrated in The Shallows. However, this isn’t the truth. In the National Geographic article, Burgess says that shark skin is so tough that jellyfish stings would do nothing to harm them or protect you. “The only place where jellyfish might have an effect is if it got in their eyes,” he says. But because sharks have a tough membrane that can easily close over their eyes, it is not likely that this tactic would work. Instead, you may be more likely to get stung by the jellyfish than suffer from a shark bite. So steer clear of the gelatinous creatures if possible. A string of shark sightings and attacks over the years prompted a number of Australian states to increase aerial patrols, according to the Washington Post. But after decades of operations, there was little evidence to suggest that there were benefits for the manned aircraft to monitor recreational waters for sharks. Some shark species only come up to the surface when they strike, while others lie deeper in the ocean. If waters are murky or skies not clear, it makes for airplanes or helicopters surveying vast areas of water for sharks close to impossible. The Washington Post suggests beaches to use a “shark barrier,” or thin mesh nets that are not harmful to the wildlife. The nets create an underwater fence from the surface to the seabed around beaches and help to keep predators out. Not so fast. The Florida Department of Environmental Protection has decided that a uniform warning flag system would benefit those visiting the state’s beaches. This means all beaches use the same color and shape for different warnings such as rip currents and other hazards. 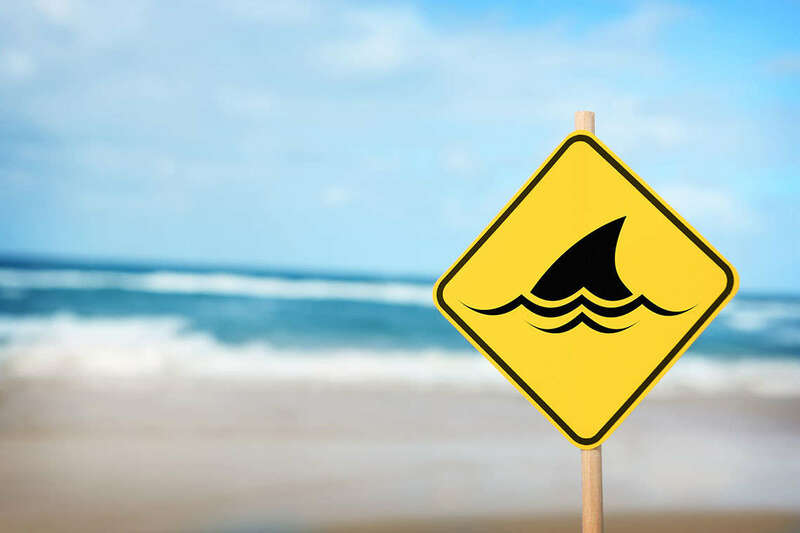 Beach safety officials at New Smyrna Beach, known as the “shark bite capitol of the world,” not only posted numerous signs of shark sightings, they also advised beachgoers to not go into the water above their knees, according to an NBC report. Be aware of all warning signs and directions given to you by lifeguards and other beach safety patrol.